A Cumbrian footballer has pleaded guilty to causing grievous bodily harm to a Bristol Rovers player. 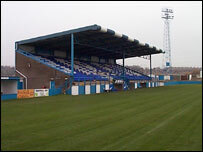 Barrow defender James Cotterill admitted, at Barrow Magistrates Court, the attack on striker Sean Rigg on 11 November. Cotterill was suspended by the FA after punching the player during an FA Cup game at Barrow's Holker Street ground. He will be sentenced in January. Mr Rigg was treated for a double fracture of the jaw after the game. Magistrates heard that he had to drink through a straw and eat with a teaspoon as a result of the punch. Metal plates will now strengthen his jaw for life, Mr Rigg said. Cotterill's solicitor described the punch as a "moment of madness." The off-the-ball incident was captured by television cameras at the game, which Rovers won 3-2. Cotterill has also been charged with violent conduct by the FA and has yet to respond to the charge. His club says it is waiting for sentencing and the FA's report before commenting, but it has previously said it deems violent conduct by any Barrow player "totally unacceptable". Cotterill will be sentenced on 5 January at Lancaster Crown Court. Rovers said Riggs could be back in action in League Two by Christmas.